The FIFA Certified synthetic turf pitch provides an elite playing surface for the PFF National Training Centre within the Philippines. Austin, TX, February 20, 2018 --(PR.com)-- Act Global has been awarded the FIFA Quality Pro certification for the San Lazaro Leisure complex in Cavite City, near Manila, Philippines. As the country's first FIFA Goal project, the pitch transformed a previously unused site into a world-class field, meeting the highest international performance and quality standards for elite level football. The certification is a culmination of efforts that began at the groundbreaking of the facility three years ago. Despite several striking engineering challenges due to topographical and geotechnical issues, our specialist engineer Mr. Bert Hammes utilized his years of experience to offer a design solution that created a stable, permeable base on this challenging site. Previously, the area had been an uncontrolled dumping site for the past ten years and lacked the required stability for sub-base construction. The addition of underground water flows and structures were truly challenging. The site is envisioned to become the training center of the national teams as well as host international competition, friendly matches, and other related events. “We are delighted to achieve this Quality Pro certificate. FIFA Goal projects are a true challenge in terms of design, civil engineering, installation, and maintenance training, and it is a testament to our engineers and installers that the field has been so well received by the Philippines Football Federation - and most importantly the players," comments regional manager Daniel Clapham. "It is a privilege to be a part of the Philippine initiative to accelerate the growth of the sport and supply the country with a synthetic turf field that spearheads safety, durability, and performance." The turf, using a Mattex fiber manufactured at Act Global's Asian production facility, offers the Philippine Football Federation a high-performance surface with proven durability. Full maintenance training was given to the local groundskeeping staff by our dedicated installation team to ensure the players will reap the full benefits of the top quality field maintenance equipment supplied by Act Global as part of their FIFA Goal project. 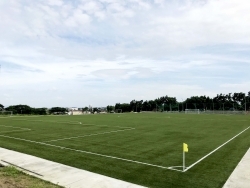 According to feedback from the Philippines Football Federation, there is little doubt that this installation is the paramount football turf field in the country. Act Global is a world leader in synthetic turf technology with an ISO 9001 Quality Certified manufacturing facility in Calhoun, Georgia, and field installations in over 80 countries. Act Global has supplied its Xtreme Turf synthetic turf to over 600 football fields. Act Global is a FIFA Quality Licensee and preferred supplier for World Rugby, the International Hockey Federation, and the United Soccer League. The Act Global UBU Speed Series is the leading brand for NFL & NCAA Division I Football Fields has been featured in the New Orleans Superdome 2013, New York Met Life Stadium 2014, Houston NRG Stadium 2017 and Minneapolis U.S. Bank Stadium 2018. Earlier this year, Act Global also produced and installed the playing surface at the New Orleans Superdome in 2017. For more information, visit http://www.actglobal.com.